"I'm quite passionate about purses...borderline junkie, I would say. My main love is Louis Vuitton, but I do 'flirt' with others. Hehe. 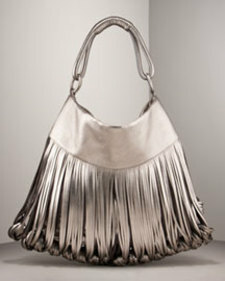 In fact, I just purchased this Katherine Kwei purse from Neiman Marcus in the pewter metallic color. It is so unique with the knots at the bottom (that is her signature--Chinese knotting) and beautiful, that I'm a little afraid to use it! Ha! Katherine Kwei is a newer designer in the purse arena. As a matter of fact, she used to work in PR for LV. No wonder I like her stuff! But I digress...it's always so exciting to share my purse finds with folks whom I know will appreciate it."